Everyone has Fun during Mardi Gras! Take advantage of our Spring Skiing Special. Special Spring Lodging rates plus 1 midweek night for 1/2 off when you stay an additional 2 nights! We invite you to call us for details. For lodging rates you may also visit our Online Reservation link. Mardi Gras at Nubs Nob (March 23rd) is the annual Spring Fling with fun and games for the whole family. Don't miss the Soaker Cup, Costume Contest, Crazy Couples and Pepsi Challenge races. Music provided by Sean Ryan and the Petoskey High School Steel Drum Band. Canadian Spring Break – Week of March 10th-17th. We would love to welcome our Canadian neighbors and offer a 50% discount on a 3rd midweek night when you reserve at least an additional 2 nights with us this week. Enjoy small lift lines and save on your lift tickets at Nubs Nob! 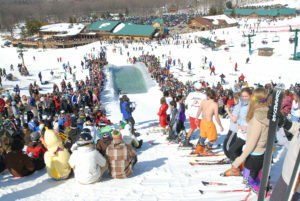 Krazy Daze at Boyne (March 16th) is also action packed! Ski racing and jumping competitions are just a few of the activities for adults and children. Come on up to check it out! We look forward to your call – 800-748-0245.